SponsorshipX is an experience-driven marketing conference created to deliver interactive learning environments resulting a more conversational atmosphere. For the first time, the event will expanding internationally to the United States and France after success in Canada. Their events encourages more open discussions and less formal talk. Mark says it is not business folks in sitting in a room, rather participants are asked to take part in the event in an interactive style with lots of engagement. The delegate panels in Nashville are made up of of 25% brand representation; there are 8-9 NFL sponsors, record labels, and agencies, as well as a millennial panel. The state of Tennessee was easy to work with as was the national convention of visitors. They helped with finding facilities, hospitality and recreation needs. Interesting that Mark started out by asking me what I thought about the AAF and it folding. While the event is not technology focused, the American Flag Football League is part of a panel of football flag, Where the Tech. 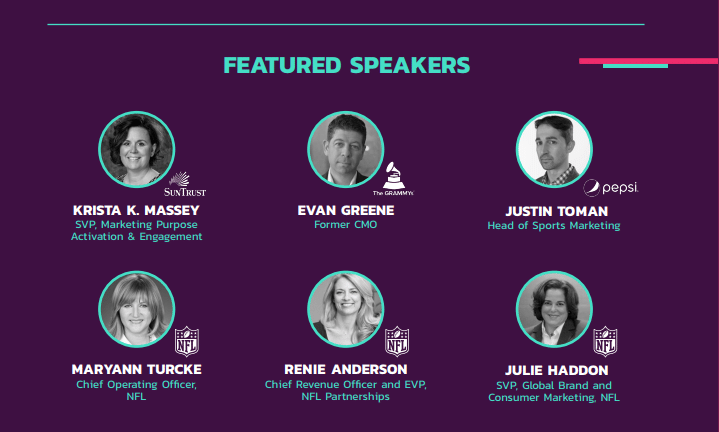 The Future Football Tech panel includes the CMO of Controlled Football League. The AFF rented out some of their tech and the AFL is using it for a play clock countdown making for an interesting sports tech tweek to football. John Davidson, TEDx and Keynote Speaker, Esports and Partnerships at GameStop, President of Esports Trade Association is Speaking at SponsorshipX together with Wendy Lecot of HyperX abd Jason Lake of Complexity Games will chat about their partnerships and offer insight about what works in the space of eSports. Representatives from Twitch, MVP and Team Liquid are also scheduled to speak. Cassandra Kilareski, Director Olympic Marketing, at Bridgestone Arena, plans to share her global perspective on digital and social customer engagement, and marketing. May 29-30, sponsorshipX is occurring at the Urban Sports Summit in France, during FISE Montpellier, the world’s biggest action sports festival. The sessions promise to uncover how to craft together multi-faceted fan experiences using various touchpoints. Attendees can view professional BMXers and other action sports specialists doing their thing. This location boasts a world-class beach and the award winning wines of l’Occitanie. Mark says his companies had a presence at the NBA All-Star Game in 2016 as well as the Toronto Film Festival so operating during large, international events is part of their multi-faceted business background, along with working alongside blue-chip corporations. They also assist sports-entertainment-charitable organizations maximize their value proposition. SponsorshipX Toronto is May 22-25. Sports Techie, Mark is building the conference globally with the goal to expand into more countries next year. I asked if Asia was a possibility with the Tokyo 2020 Olympic Games next year. He said Southeast Asia and Africa are both terrific opportunities. They would like to work with the Atlanta Falcons and other local brands and agencies, says Harrison. “Brands with purpose,” he said. Streaming of the Toronto and France events are yet to be determined. Nashville will not be streamed. The event is not sold out yet. Use password “Mark Harrison” for the early bird cost of $1350 rather than $1795. Thank you, Mark! This all sounds like a labor of business love for Harrison. His Canadian viewpoint across social and digital platforms are indeed refreshing. The event is also unique and compelling. The NFL draft is set for Thursday, April 25. ABC (first round) alongside ESPN will broadcast the entire draft. 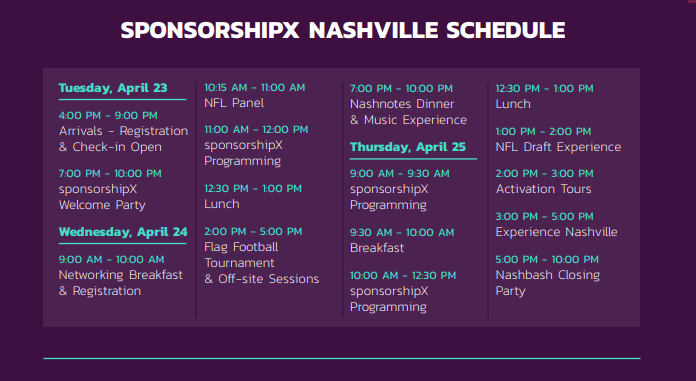 SponsorshipX, Nashville, NFL Draft week, it’s hard to get any better of an event launch than that.